By 1 January 2010 The Nitrate Pollution Regulations require farmers in England to produce a Risk Map for each field where organic manure is spread. To save you time and paperwork we can take your information and prepare your maps for you as part of a set of service packages provided by Farmwise Associates Ltd, a company established to simplify the process of NVZ Compliance for arable and livestock farms. 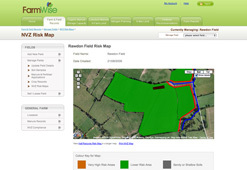 The Farmwise NVZ service can integrate your Risk Maps within your online farm account. Alternatively we can take your data and send to you to be held by you separately with a link to view your maps on your computer. If you are intending to spread livestock manures, sewage sludge, composts, food wastes or other treated or untreated organic wastes you must identify on a Risk Map the areas of land on your farm where manures can be spread to comply with the NVZ Rules. You must show where manures cannot be spread or can only be spread when certain conditions apply. You supply us with hard copy details of your O.S field locations, size and risk. 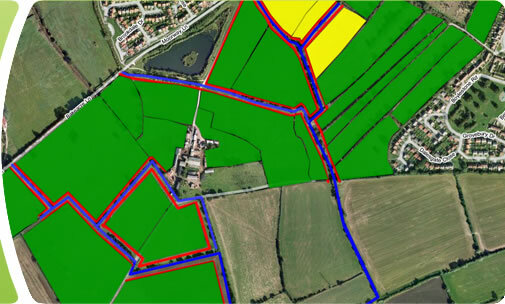 We locate an aerial image of your farm and identify the individual fields from the data supplied. Next we incorporate the risk assessments within the field images adding the name and risk classification based on the colour coding set down in the Rules. For a single fixed price we can provide up to 15 maps; More field maps can be purchased at a set rate.